Creating folders from scratch can seem daunting, so bookmark this guide to help you create an incredible media section for your app. The photo thumbnails for each section can be images or stock photos previously uploading to and taken from the assets section of your CMS, or you can create labels and logos yourself on picture editing software. 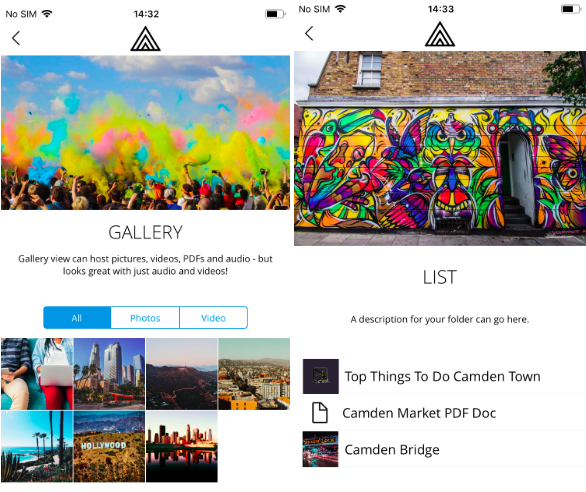 The image to the left hand side displays a Gallery view, with thumbnails of your pictures shown in a grid. The Gallery view can host pictures, videos, audio and PDFs. 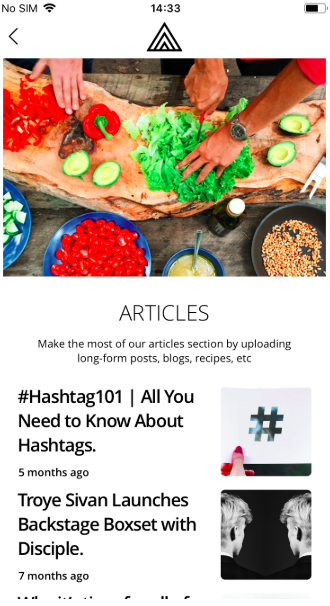 Articles are a great way to show long-form posts, such as blogs or actual articles, and allow you to hyperlink out to other sources within the article itself. You can upload a video or an image as the article header, which appears as a thumbnail next to the title. It's important to note that if you would like a folder with Articles, you will not be able to also host other content such as images or PDFs within this exact folder. It is exclusively for your articles. Next, we have more Folders! This is a great way to host additional content without having your main folder screen be too overwhelming. A good example of this is having a two Galleries within one folder, as can be seen on the Sonam Kapoor App, so end users can easily browse different photo shoots and events. You could also have an About Us folder with two more folders within, one linking to Articles with employee Bios and another to videos or PDFs.